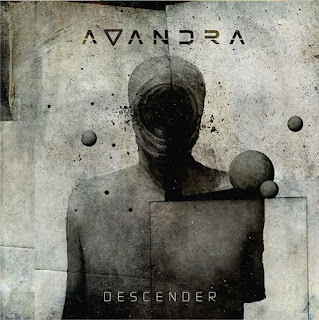 Christian Ayala is the founder of Puerto Rico-based progressive metal band Avandra, which is releasing their second album, titled Descender, through Blood Music on April 26. The album, which was written in the dark following Hurricane Maria in 2017, features three prominent guest musicians: Kevin Moore (ex-Dream Theater, Chroma Key, OSI), Richard Henshall (Haken) and Daniel Schwartz (Astronoid). The album was mixed by Schwartz. Q: For those who aren't familiar with Avandra, how would you describe the band's music? CA: I would define it as prog-mospheric. By this I mean the band is certainly progressive metal in many ways, but while it seems to be the norm that prog metal now has a lot more to do with technique than with a sincere search for an emotional connection with the listener, Avandra is about trying to strike a balance between the technical and the atmospheric/emotional. I always intend to take the listener through a journey, both musically and lyrically, for I never write lyrics just for the sake of it. They always have to mean something, meaning, in a kind of tautological way, have a deeper meaning than what they might seem to have on the surface. Q: What's the meaning behind the name Avandra? CA: So, I went through a few before landing on Avandra, and dodged a couple of bullets, such as Project Geneva (name influenced by the album by Russian Circles, Geneva). The name comes from a Dungeons & Dragons campaign that I was preparing with a friend. We began to explore the fourth edition and it included a new deity, the goddess Avandra. She was the goddess of travel, adventure, luck, and several other things. I liked what it represented: travel, for all those trips that one has to do while on tour; adventure, because really having a band (and one more serious than a mere "hobby") is an adventure; luck, because you have to be lucky to be recognized in this industry, and also because "fortune favors the bold." Apart from that, it is a name that can easily be pronounced in many languages! Q: How and when did the band members meet? CA: Once the first album, Tymora, was released on May 5, 2017, I began to receive many messages from people asking me when they were going to see us live. What a lot of people didn't know was that Avandra was done as a half-conceited\vanity project. I did it because I said to myself, "if I die someday soon, I want to have left some of my creativity in the world," so playing live was not something I had in mind. But the pressure to do it was mounting, until I said, "well let's experiment." I auditioned a few musicians and after about a month of it I had a full band. The first show we did was in August of 2017, in the town of Caguas, and it was fantastic for us. One of the things that I found most curious is that people had this look on their faces like "what's going on?" Haha. In a good way, of course. The musical chemistry we had was such that I knew that with this line-up was it. So, we got to recording the second album a few months after the official band had formed. Q: Tell me about the upcoming album, Descender. What should fans expect and how has the band's sound evolved since your first album, Tymora, was released in 2017? CA: So one thing I always try to do is write what comes naturally to me. My Holy Trinity of Dream Theater (especially the Kevin Moore era), Opeth and Porcupine Tree runs through my veins, so at the time of writing, those forces are automatically channeled. What I was looking for was to have a certain "mood" that would connect all the songs, regardless of their dynamic variability. By "mood" I do not mean a transitory affective state, but the definition that Martin Heidegger uses in his book Time and Being, where he defines it as "a way of being in the world." All the songs are connected as if they lived in the same universe. So it does not matter if the song is "A Decision Must Be Made" (much simpler in its structure and technique) or "The Narrowing of Meaning" (much longer with a somewhat crazy structure and technically much more advanced), the "mood" in both songs is one of thematic and emotional cohesion. To say we have evolved musically since Tymora I think is 110% correct. I feel this album is leaps and bounds beyond what Tymora was. I wrote with new energy, and the album is more diverse and interesting, both musically and technically, than Tymora. Of course, Tymora still holds a special place in my heart, and I still find it to be a great album, but Descender is a whole 'nother beast, thanks to what the other musicians brought to it (Tymora being a one-man project creation). Q: Is it true that you wrote the new album alone in the dark after Hurricane Maria? CA: I wrote (most of ) the lyrics and music during the time of total darkness after the reckoning of Hurricane Maria (Hurricane capitalized here for respect, haha), yes. I was studying for my master's thesis, so I was reading a lot. It was the only thing I did: read and write music. Many of the lyrics of the album are then deeply influenced by the readings of the moment (especially the philosophy of language in Nietzschean thought). Music to a certain extent too. My mother has one of those power plants, which she would turn on for a few hours in the day and some at night. I went to her house to charge my iPad, where I have BIAS FX, and I started to write music with my PRS guitars, with only the brightness of the iPad hitting me in the face. Q: You released a lyric video a few weeks ago for the song, "Derelict Minds." Have you been happy so far with the fan reaction? It seems like people, myself included, are loving it. CA: I am super excited that people have liked it so much! Honestly, I was kinda worried. I have trust in my creations but that doesn't mean that everyone will react in a positive way. Even more, Blood Music, the label we are signed to, is known for more aggressive and extreme acts, so I honestly thought their fan base would absolutely hate it. But so far it has been great. There have been quite a few Cynic comparisons, but the funny thing is the first riff was written before Cynic's Traced in Air came out. It was mainly influenced by Dream Theater in When Dream and Day Unite, especially songs like "Afterlife" and "A Fortune in Lies," and a small lick in "Innocence Faded" where John Petrucci does the two-hits-per-note technique (double picking) in one of the pre-chorus. Q: Kevin Moore (ex-Dream Theater, Chroma Key, OSI) made a guest appearance playing keyboards on "Derelict Minds." How did you guys link up with him? CA: So, I should make it clear that he only did the synth solo in the song. That being said, I always, absolutely always, write with a "What Would Kevin Do?" mentality, so in an indirect way, Kevin is there, in spirit, haha. We got linked up one day I sent him a message via Facebook. I had sent him this really heartfelt message explaining his very important musical influence on me, and I asked him if he would do a keyboard solo for one of the songs. He said yes and did a great one for "Derelict Minds." I do plan on recording a full song with him for the third album, which is 5/8th of its way completed, song writing-wise. Already talked to him about this, so it’s very, very probable it will happen. Q: What did Kevin's performance add to the song and what was it like to work with him? CA: I feel his solo adds a lot of depth and feel to the part where he plays it. Makes it more interesting. Kevin has a good ear (obviously) for where to phrase what and what sound to use when doing so, and he did not disappoint. Working with him was quite easy. We emailed each other a couple times. He nailed it on the first try, so there wasn't too much back and forth between us in that respect. All in all, everything flowed well. Q: Are you a fan of Kevin's previous music and has it inspired you in any way? CA: To say I'm a fan of Kevin's is an understatement, to be honest. He has shaped my musical creativity in a way that few others have. As mainly a guitar player, one would think Petrucci had the biggest influence on me out of all the members of Dream Theater, but it was actually Kevin who inspired me the most. He is what made Dream Theater the mystical experience I had when I was a young kid and first hearing them at the age of 14, granted, the first album I ever listened to from them was Falling Into Infinity, but it wasn't until I heard Images and Words that I would never be the same again. After I learned of his departure (he had already done so like five years before I had my first DT experience), I kept up with his work. Even though I like OSI, Chroma Key was what continued the KM experience for me, especially Dead Air for Radios and You Go Now. It was like hearing the ambiance and emotion I loved about Dream Theater, but stripped from its cumbersome technical approaches. Q: Tell me about the other guest musicians, Richard Henshall of Haken and Daniel Schwartz of Astronoid. What did they bring to their respective songs? CA: Richard added an amazing solo to the end of one of the longest songs called "The Narrowing of Meaning." Dan added digital percussion to a song called "Q.E.," which is the album closer. Originally, I had thought of adding digital percussion to the song, but lacked the experience of doing so, and Dan just happened to ask me as we were finalizing the album's mix if I had thought about adding them to it. I said yes, and like five hours of working on them, they were added to the final version of the song. It makes the song more dynamic and just interesting to listen to. Q: I also noticed that the talented Travis Smith did the album's artwork, which looks great! What's the meaning behind the cover illustration? The concept of the cover was worked out between me and Travis Smith. The label (Blood Music) had recommended Travis since he had been long time collaborator, though, as I understand it, we were the first band on the label that worked with him for an original art piece. The main idea I had in mind stemmed from the running theme of the lyrics on the album, which is language and its poietic (creative and formative) power. The album name, Descender, ties into the language aspect, for its about climbing into one's self and using dialectical introspection as a tool to get to "know thy self." Hence, the void faced man with a spiraling path that leads to its interior world. That interior world echoes and ripples into the outside world, hence the black matter that is pours out from him, creating new universes of thoughts and realities. This also works in a feedback-loop kind of way, where the void swallows all of the external world’s influence, us being embedded and embodied organisms, and hence creating a universe within. This idea runs throughout the six-panel digipack casing (and whatever other casing it will eventually come in). Travis Smith went far and beyond anything we could have hoped for and comes HIGHLY recommended on my part. Q: What can fans expect lyrically on this album from Avandra? CA: Conceptually, the album follows the thread of poietic power of language. Poietic comes from poiesis in Greek, meaning formative or creative. In other words, although there are some songs that do not necessarily follow this thread, the album is based on the idea of how language can help us realize the infinite powers that exist within us, but that can also suppress and oppress them. "The Narrowing of Meaning," for example, is the song that best explains this. It is a deep and real analysis on a vague and obscure language used by politicians, for example, when they try to appease people using words that mean nothing by themselves as when, in my case, they say "I follow the values, Puerto Ricans, and you must follow them too." This is code for just do what I tell you, because I'm not going to define the word value. The same with church pastors, one's parents (in some cases), etc. It is a war against those who want to say "my language is the right one because naturally it is so," but as Ludwig Wittgenstein said, the meaning of the words is in the language game, that is, in its context (social, cultural, economic, geographic, etc. ), so that nothing "natural" has, and therefore the ability to transvalue the negative values created by those oppressive languages becomes infinite. Q: Any plans to tour for the new album? CA: We are planning a small 10-day tour in August, along the east coast of the US. It'll be our first one as well! Follow us on Facebook and Instagram to stay tuned (links at the end of the interview, so read on!)! Q: What are some bands or musicians that have inspired you through the years and what are you listening to today? CA: I have a whole myriad of different bands and artists that I have to thank for the different aspects of my writing, starting from the age of four when I became a huge Michael Jackson fan. I would sit my family down on the couch and sing to them using a hair brush as a mic. At the age of 8 I discovered The Beatles and they were the first band I ever became obsessed with. To this day I listen to them almost on a daily basis. At the age of 10 I started shifting into the more contemporary pop and rock (this was 1995, so, "contemporary"). I was really into pop acts like Savage Garden and Hanson (yes, Hanson, and yes, pop not rock, haha) and rock ones like The Wallflowers and Oasis. At 12 I discovered The Foo Fighters, 311 and Green Day. So, for a year that's all I would listen to, until the age of 13, where it was all about Metallica. At the age of 14, though, I heard Dream Theater for the first time via a band that was playing at my brother's high school welcome party. My whole life changed that day. I became obsessed with finding out what song it was from Dream Theater they had played. I started by buying Falling Into Infinity, and even though I didn't find the song, I loved that album and it was all I would listen to for months on end. It all really changed when I heard Images and Words. I had no idea the transformative power of music until I heard that album. I remember saving up lunch money and eating scraps my friends would leave on their plates in order to afford every single Dream Theater album after that initial FII one. I also think that has a lot to do with my emotional attachment to the band. First time I would choose music over good food. A sacrifice I will never regret. Q: What's the progressive metal scene like in Puerto Rico? CA: Thrash metal is king in the current scene. Like in all scenes, some bands are doing it right, some are expanding on it in an innovative way, some are, well, not great. There are bands that are starting to break out from this, though. One of my favorite bands in the local scene, and I'd dare venture to say of all the stuff out there internationally, is called Moths. They mix stoner/doom, which is starting to trend (or has been trending) for a while now in the metal scene of the U.S., with jazz and progressive music, and that's where they really leave most stoner/doom bands in the dust. Q: How is Puerto Rico doing in the aftermath of Hurricane Maria? CA: Maria was devastating both structurally, culturally and economically. Structurally there are people that had to straight up leave Puerto Rico, because they literally didn't have a home anymore. My maternal grandfather lives in the mountains of Humacao (a town down here) and a lot of the houses around his are super old. A lot of them were made of very fragile material or just badly built. Needless to say, a lot of the don't exist anymore. Thousands of families have left for the mainland, leaving P.R. 's population in a state of reduction since its passing. There's a lot less people out in the streets as well. As an example, pre-hurricane, you couldn't go to Plaza Las Américas (biggest mall in the Caribbean) on a Friday or Saturday, 'cause it would be impossibly packed. Now, you can walk around comfortably, which is good for the general public, but pretty bad for businesses, of course. A lot of local businesses have had to close or move to the U.S. to resume operations. In other words, it's a wound that's still healing, but we'll get there. CA: Hopefully recording, or at least working on, our seventh album, and with many tours under our belts. Also, doing this full-time. There's a lot of music still left to write without those pesky day jobs getting in the way! Q: What websites can people visit to for more information on the band?